The treatment system your hair deserves, Inoar Doctor is the complete treatment system for your hair, which consists of hydration, nourishing, and reconstruction. The treatment system your hair deserves. 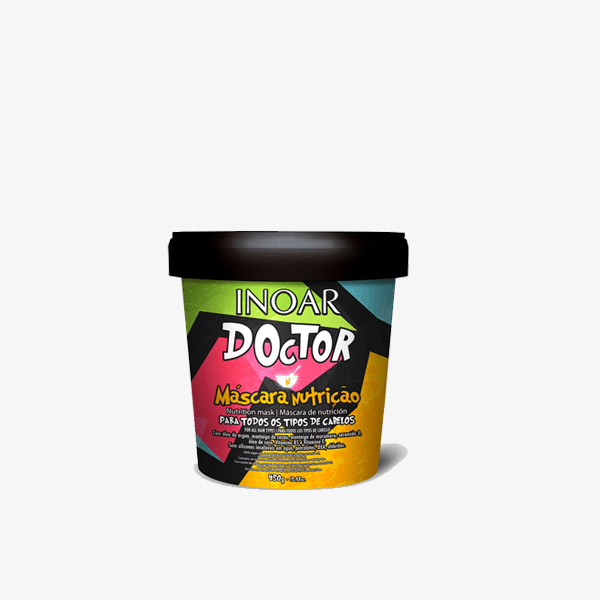 Inoar Doctor is the complete treatment system for your hair, which consists of hydration, nourishing, and reconstruction. Composed of a multifunctional shampoo and 3 masks with different compositions (H, N, and R), leave your hair always beautiful and ready to face daily challenges. Alternate the hydration, nourish and reconstruct masks according to the needs of your hair and have healthy hair, always! With panthenol, vitamin E, vitamin B5, pantothenic acid, aloe vera, and semi-flax. Action Valine, Arginine, Cysteine, Creatine, Proline and Glutamic Acid: rebuild the capillary structure, restore strength and flexibility. Sericin: high affinity with other proteins, forms keratin bonds in the hair and creates a tough, moisturizing and protective film. Wheat Germ Extract: forms a film around the wires conferring softness, shine, and softness. Hydration, nutrition, and repair of threads. Fuller hair, with a soft touch and noticeably shiny. All types of hair, ideal for dry and damaged hair. Wash hair with Doctor Shampoo, massaging for 3 min. If needed, repeat the operation. Alternate the use of masks according to your hair schedule. Spread the Doctor Mask chosen, involving it strand by strand. Let it stand for 5 a 10 min. Rinse it completely. Finish as you wish.